An alleged thief was reportedly forced to surrender to the police after the stolen bag of goods got stuck to his head. 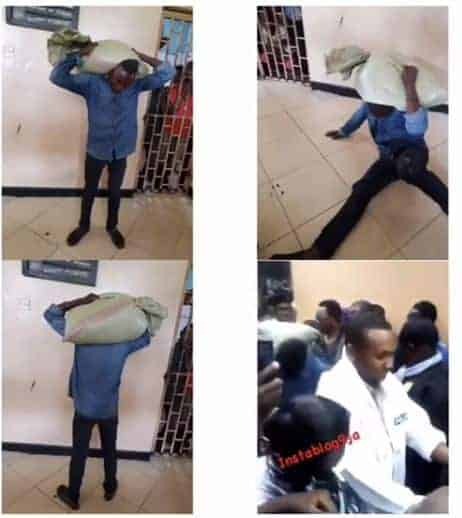 According to reports, upon stealing the bag filled with maize, the suspect discovered that he couldn’t place the heavy bag down and cried for help. It was then gathered that the owner of the farm produce had made use of some voodoo charms in order to safeguard his property. LOL. WE NEED THIS JUJU EVERYWHERE IN THE WORLD. I WILL INVEST MY MONEY THERE. BUT WHY THIS KIND JUJU NO FIT CATCH POLITICIANS!!!! !